Here’s How Amiibo Works in Smash Bros. Earlier today, Nintendo finally revealed exactly how the Amiibo figurines will work for the new Smash games, and gave us a comprehensive explanation of their exact uses and advantages. 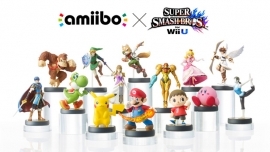 Basically, the Amiibo figurines are small companions that can be used as playable characters when connected to the Wii U. You can use Amiibos in regular battle, and they are all fully personalized, with ever-changing stats, custom movesets, and a level-up system that grows along with you as you play with the character more and more. In-game, the Amiibos are known as Figure Players; to activate them, simply connect them to the NFC touchpoint on your GamePad and they will become playable characters in the selection screen. A Figure Player will grow and level up with each use, reaching a maximum level of 50. Each level will grant it higher attack and defense stats. Playing with the same Amiibo on different consoles and fighting other Amiibo figurines will help increase its level faster. You can customize your Amiibos by giving them different custom weapons and costumes to give them advanced strength, defense, and speed. Each Figure Player can hold up to three different special abilities that are granted to it through these costumes and weapons. You can also customize your Amiibo’s special moves the way you change every other character’s, and choose whichever you like best. Your Amiibo fighter will also learn to shape itself according to your abilities and specific fighting style; it will change to favor different stats, so each Amiibo will be perfectly fit for its user. Amiibos will also collect different exclusive rewards like gold and custom abilities during battle, which you can then keep. That’s all we know about the Amiibo figurines and their use in the new Smash game, which will be released on November 21st. What do you think? Would you buy one of these? I personally never thought I’d be much interested, but I might actually end up buying one; they look great.